The new year is quickly approaching and 2013 is sure to bring exciting, new products for boaters and fisherman alike. One in particular, is the all new Regulator 34′ Center Console boat. 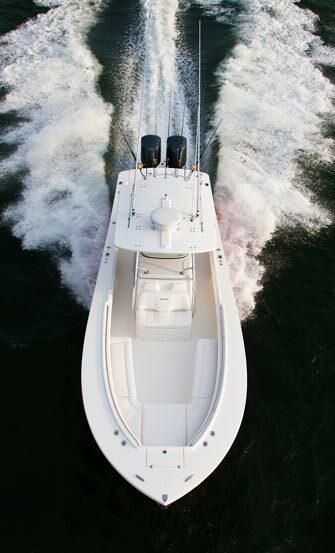 This gorgeous new boat has the largest cockpit in its class and is sure to impress the ultimate sport fisherman. Features include; above deck live well, walk through tuna door, transom fishbox, two 350 HP outboards, all-fiberglass stand-up head, and an optional refrigerated transom fishbox. It’s large console can fit two 14-inch displays and a dedicated berth for sleeping or storage. Regulator boat designers had everything in mind when creating this new fishing boat. The Armstrong bracket allowed their team to take back the transom and motor mounts, allowing you to maximize deck space. If you’re interested in this new Regulator boat, be sure to contact Ocean House Marina – your trusted Regulator Boat Dealer serving Rhode Island, Massachusetts, and Connecticut.